Added on June 16, 2013 by Daniel Kuney. Mail on iOS generally requires a lot of taps to perform even the simplest of tasks. For instance, if I want to archive an email without opening it first, I have to tap the phone six times (I counted). As pretty as the Mail app may be, that’s just bad design. A third party email app called Mailbox was released earlier this year that offers many improvements over the native Mail app. The main focus of Mailbox is to remove emails from your Inbox that you aren’t ready to respond to and send them back to your Inbox when you are ready to deal with them. This approach to managing email is called Inbox Zero. Even if you don’t buy into Mailbox’s philosophy behind Inbox Zero, Mailbox has two killer features that can save users a lot of extra taps and time. Perhaps one of its most clever and standout features is its swipe to archive gesture which actually performs two tasks in one. First, it marks an email as read if it isn’t already and, second, it moves the email to the archive folder. 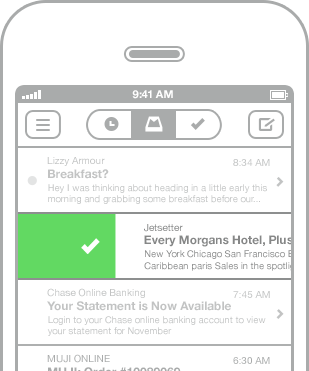 That’s just one swipe compared to the six taps it takes to perform the very same function in iOS Mail. Mailbox also has a unified search box which searches all of your main folders simultaneously including your Inbox, Archive and Sent Mail folders. While iOS Mail also has a search box, it only searches whichever folder you happen to be in. So if you are looking for a message in your Archive folder you have to perform at least three taps to first navigate to the Archive folder from your Inbox. That’s three taps compared with no taps in Mailbox. That being said, Mailbox can currently only search emails that are still stored on your device. Depending on how many emails you receive, that means Mailbox can probably pull up your emails from the last few weeks when you search. Apple’s Mail on the other hand will perform a server side search once it has completed a local search, giving you far more comprehensive results. Mailbox says that server side search is on its roadmap. Apple’s Mail also a few other features that I prefer to Mailbox. First, Mail gives me finer control of my notifications. I have three email accounts that I use regularly (work, personal and websites). On Mail I can opt to receive notifications for my work and personal email accounts, but not for my websites account, which is what I use to sign up for sites like Amazon or Kayak. But on Mailbox I must either turn notifications on for all of my email accounts or for none - a choice I really don’t want to make since neither option is ideal. Also, Mailbox has a frustratingly small compose window for new emails. While it looks cool, Mailbox overlays the compose window over the inbox instead of taking over the screen as is the case on Mail. To display the same amount of content that Mail can display Mailbox uses a smaller font to squeeze everything in. The net result is a cool design that just feels claustrophobic on Mailbox. 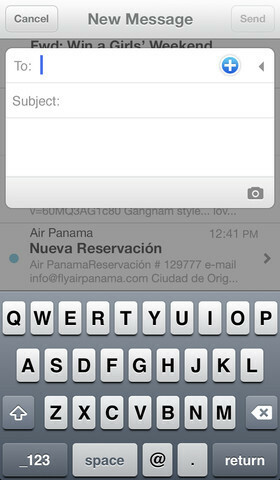 Last week Apple showed off a preview of their upcoming iOS 7 which includes a redesigned Mail program. It’s gorgeous no doubt, but I’ll be looking to see how it performs. If Apple can simplify the number of taps needed to perform basic functions I may just switch back to Mail. But right now, even with the few inconveniences I mentioned above, Mailbox is my primary email app on the iPhone and iPad.